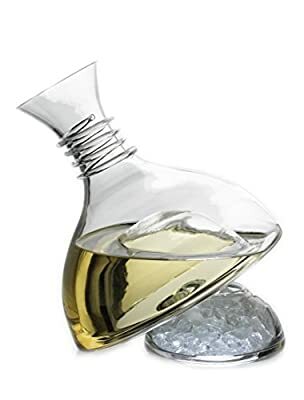 VinoLife 8103 Bellina White Wine Decanter 1 lt. Product prices and availability are accurate as of 2019-04-19 15:28:52 UTC and are subject to change. Any price and availability information displayed on http://www.amazon.com/ at the time of purchase will apply to the purchase of this product. Vino Life Bellina Decanter 8103, 2 piece st with Ice Bowl. 1 Litre Capacity, 1 Decanter. Vino Life lead-free crystal decanters are blown in Europe by craftsmen with decades of experience in creating fine glassware. The Bellina White Wine Decanter is specially created to maintain the perfect temperature for chilled white wine. Just place you chilled white wine in the carafe and fill the ice bowl with ice cubes to maintain the perfect temperature while you enjoy!.